This is one of our original designs created for a local Catholic Church. Each page is a level of donorship, and allows for individual names. Donor Levels are laser engraving into the wood pages. 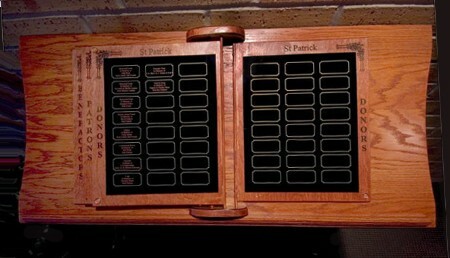 Names are engraved on a brass-like plate that is easily updated. If your organization is looking to recognize their donors within a small space, this may be the perfect solution. 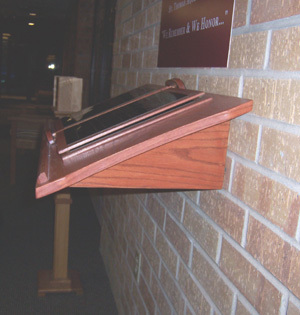 It includes a shelf that adheres to the wall, made of wood or laminate. Wood pages available in maple, oak, walnut, and even bamboo. Each book is custom made to your specifications, size, number of levels, headers, logos, titles, color, and number of donors are all incorporated. This book includes 6 total engravable pages, two moving wood pages printed on both sides and two pages adhered to the shelf. Your choice of stain, and choice of metal plate colors. You will receive renderings and art proofs before proceeding to production of your book. View our most recent Donor Project Portfolio to get ideas for your upcoming project.